Perhaps it's fate that State College, Pennsylvania, home of my alma mater PSU, will see its first Trader Joe's store open later this year. Maybe it's no coincidence that this blog, fueled by a love of Trader Joe's food, is helmed by a duo of proud Nittany Lions. And possibly it was no accident that this ingenious cookbook, authored by professional chef and food writer Andrea Lynn, is now available to Penn Staters and other college students around the country, to potentially save them from the same food-crimes that I myself fell victim to some 10 years ago there in Happy Valley. During my college years, I lived in a big house on Beaver Avenue with five other guys, all Penn State students. To put it mildly, our house could have used an interior decorator's touch. But as a wise film professor once told me, "Your budget is your aesthetic." That statement was not only true for filmmaking, but it could also be applied to nearly every facet of living, and we, the inhabitants of 622 W. Beaver Ave. took that idea to heart, decorating our house as our ultra-low budget dictated. Our shelves were lined with light-up Santas, LP record covers of bands we'd never heard of, a few mannequin heads, and a five-foot tall styrofoam cactus from a Chi-Chi's restaurant. We took what we could get, and we made things look interesting, if not aesthetically pleasing. Our budget was our aesthetic indeed. And eating habits were no exception. Our cupboards were a collection of college-fare clichés. Cans of tuna and Spam lined the shelves, topped by rows of easy mac, ramen noodles, and loaves of semi-stale bread. We were frightened of cooking and intimidated by grocery shopping. Taco Bell's 49¢ taco night was the sole representation of "international cuisine" in our diets. In short, we were poor, and we ate poorly. 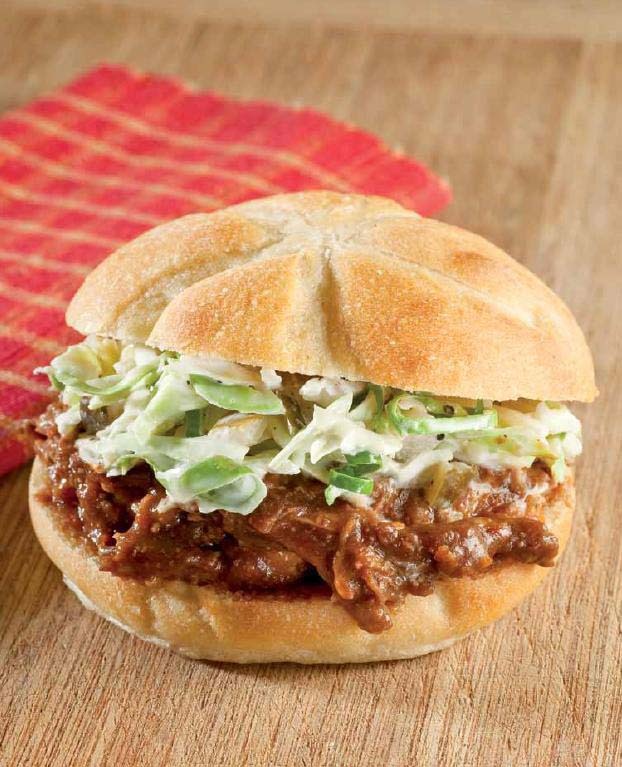 However, today's collegian need not suffer such culinary woes—not even one who's strapped for cash—not so long as he or she has a Trader Joe's store nearby and The I Love Trader Joe's College Cookbook in hand. With incredible full-color photos and easy-to-follow instructions, the book guides readers through 160 pages of cheap and painless recipes. 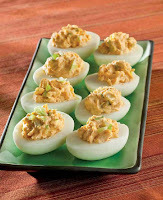 Even the most inexperienced cooks can whip up dishes like the Thai Red Curry Deviled Eggs, pictured right. Don't think you've got the culinary skills? 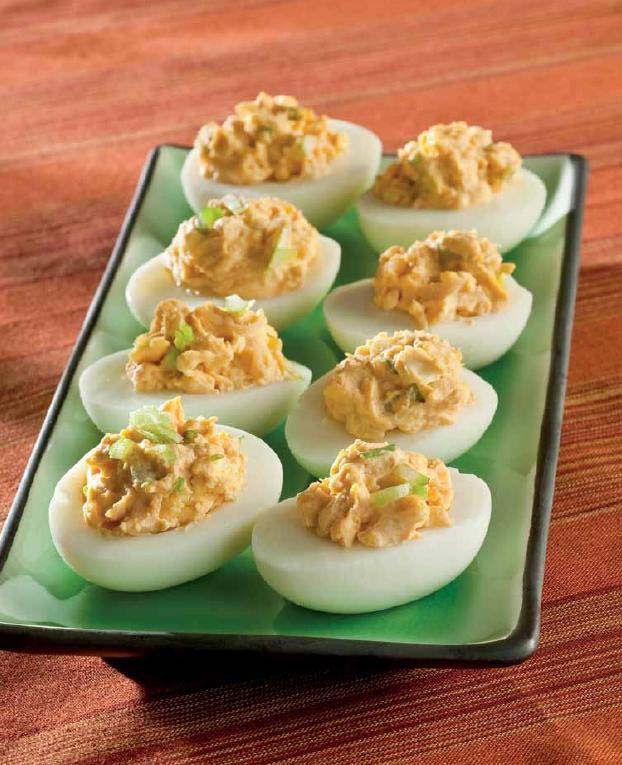 No worries, these are "dishes you can't eff up." The foods in this book are seriously simple to make. There's a system of icons indicating things like which recipes require no cooking, which ones take less than five minutes to prep, and which ones can be made using only a microwave. Most of the recipes only list 3 or 4 steps of instructions! It really doesn't get much easier than this. There are even drink recipes in here: both non-alcoholic and otherwise (for college students that happen to be OVER the age of 21!) And really, I graduated from PSU a decade ago, but I am still opposed to spending a lot of time in the kitchen, and this is totally my kind of cookbook. It isn't just for university students. Think college kids, but also think bachelors, lazy people, fans of Trader Joe's, and lovers of all things streamlined and efficient. 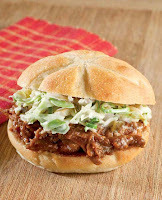 Man, that pulled pork sandwich picture is making me hungry. 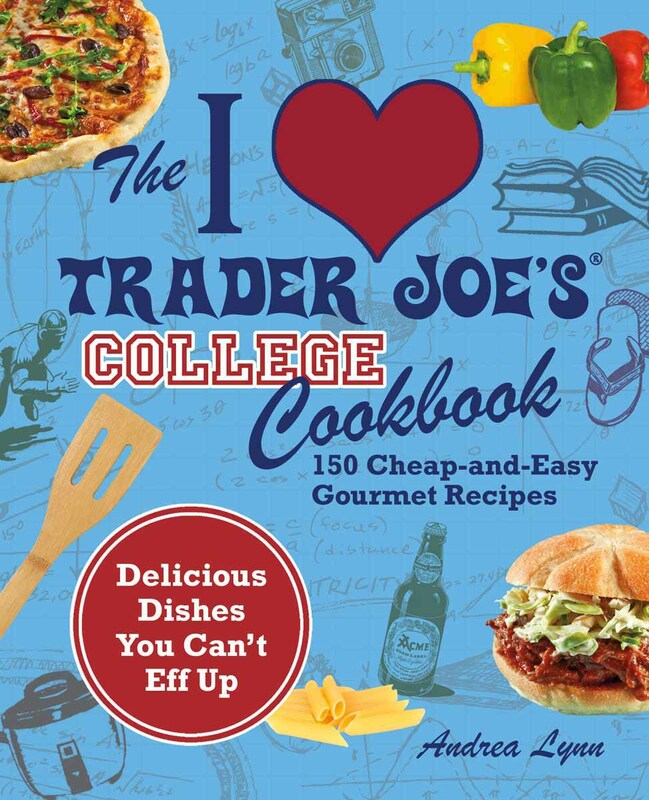 And yeah, you guessed it—you can make it with a recipe in The I Love Trader Joe's College Cookbook, available now on Amazon. 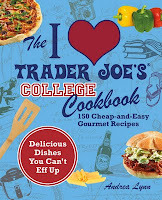 Also stay tuned for our next reader contest in which you could win your very own copy of Andrea Lynn's I Love Trader Joe's College Cookbook! In the meantime, check it out on Facebook and click "like"! Very interesting! Thanks for sharing. By the way, if you haven't tried the new skinny air popped potato stick thingies, skip 'em. They literally taste like nothing. I'm waiting to see if the birds will eat them or if they'll just melt into the earth. Blah.